KEEPING its rich heritage and commitment of customers in mind, Rokde Jewellers will be opening its fourth fully functional showroom of exquisite jewellery and unique collections in Laxminagar Square in the city. The grand inauguration of the new showroom will be held for three days. The mega event will start from March 30 and contine till April 1. Rajesh Rokde, Director of Rokde Jewellers, announced this here on Tuesdy while addressing a press conference. 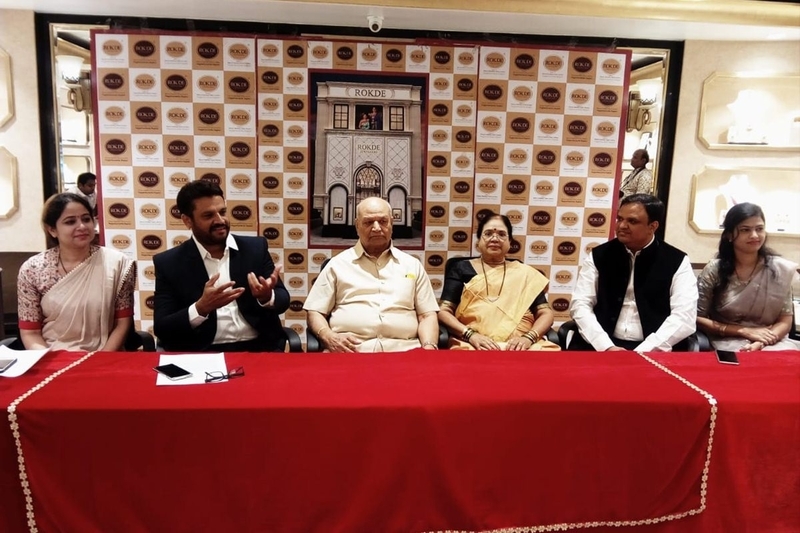 All the directors of the company including Bhaiyya Rambhau, Vandana Rokde, Anamika Rokde, Sanskruti and Sarang Rokde were alos present on the occasion. “Since inception in 1920 by Bhaiyya Rambhau Rokde, Rokde Jewellers in Itwari has earned reputation for its top-notch quality jewellery, class-leading hospitality and timeless craftsmanship. This legacy has now been taken forwarded from Itwari to Badkas Chowk, Mahal. Not only this, Rokde Jewellers is also the only local brand of the region to own a jewellery store in Dr Babasaheb Ambedkar International Airport, Nagpur. It is a matter of great pride for us,” said Rajesh Rokde elaborating on the journey of the company. Every single piece of jewellery at Rokde Jewellers is made with passion and dedication and this has resulted in world famous institutions bestowing Rokde Jewellers with certifications like Hallmark, International Gemological Institute, Gemological Institute of America etc., he pointed out. Apart from this, he said, “One of the most important features of Rokde Jewellers is the making charges, which are irresistibly lowest when compared to the other jewellers in the city. The making charges have not roadblocked in owning and enjoying the ownership of jewellery. Apart from this, every showroom of Rokde Jewellers is an exemplary example of great craftsmanship, attention to details and perfection. Rokde jewellers with hard-work and tireless dedication it has now become a cynosure of every Nagpurian.” “Wearing jewellery is an undeniable part of our rich heritage and culture. A person can spruce up his style quotient or celebrate the small titbits of life by sporting some jewellery which is super important. Keeping all of this in mind, Rokde Jewellers has been offering for decades and to everyone a timeless and exquisite pieces of jewellery that is not only great on your pocket with minimum making charges but also stirs up your soul every time you hold it in your hand,” he added. For details, interested persons may visit the new Rokde Jewellers showroom located at Laxminagar Square in the city or call of following ph no. 0712-222010.